Straying a bit beyond Tower Grove Avenue which is the main focus of SafeTGA.org, I investigated the new bike infrastructure being laid out on newly resurfaced Arsenal Street. 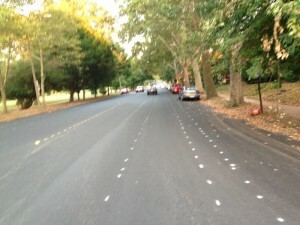 The section of Arsenal from Roger to Grand (0.6 mi) has been restriped and a buffered bike lane is being laid out. The new layout has an 8′ parking lane, a 2′ “buffer”, a 5′ bike lane, and a 10′ travel lane. Photo below. New lane layout on Arsenal between Roger and Grand is currently marked in spray paint. There is a parking lane, a narrow “buffer strip”, a bike lane, and a travel lane. I think this layout is very well done, with the lanes indicating the safest place for cyclists to ride, and a “buffer” in the dangerous door zone next to parked cars. This also functions as a road diet, and may moderate car speeds. Because this stretch is next to the park, it avoids many of the complications at intersections. The westbound bike lane at Spring is thoughtfully done, and deals well with the two car lanes (straight, left) at that location. My principal concern is the eastbound intersection at Grand (photo below). The bicycle lane ends a few hundred feet before the intersection, and there are three car lanes: a right turn, a straight, and a left turn lane. Coming to this intersection, wanting to go straight, I wasn’t sure where to position myself. Also, cars park very near the intersection, further obscuring the lanes. 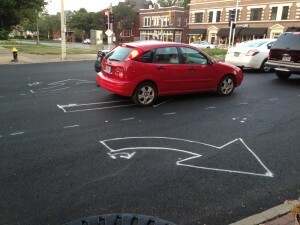 I suspect that painted arrows will help, and hope that parking will be pushed further back from the intersection. All the same, it is disorienting for the lane to suddenly end with no further guidance. Arsenal eastbound at Grand splits into three lanes as shown here. The bike lane ends before this, and its not clear what signage cyclists will have to guide them through the intersection. I would suggest that, as the bike lane ends, some bicycle-specific signage indicate what’s happening. A sign like “Bikes May Use All Lanes” would be helpful; a sign with a diagram of the intersection, indicating proper bicycle position for different paths across the intersection, might be much better. I talked to another cyclist while riding the route (frequent rider, mid-20’s) and she said that this route definitely needs better bike lanes. I agree, and think this is a well executed treatment which addresses many cyclist concerns. The Grand intersection, however, is a potential weak point which additional signage may address. What do you think? Please share your concerns and suggestions here or on our Facebook page. ‹ Tower Grove Ave: What’s Next? Last Friday we rode the new Arsenal bike lanes with Paul Wojciechowski, Senior Associate at Alta Planning and Design, who plays a key role laying out bike lanes in St. Louis. Paul, an experienced cyclist himself, explained some of the issues that make the eastbound Arsenal at Grand intersection unique and challenging. Based on feedback from us and other cyclists, Paul will recommend several changes to help riders negotiate the intersection: ending the bike lane earlier, pulling back parking, and painting stripes/sharrows to indicate more clearly correct cyclist positioning for left, straight, and right turns. Thanks Paul for your thoughtful attention to bike infrastructure and willingness to incorporate feedback. 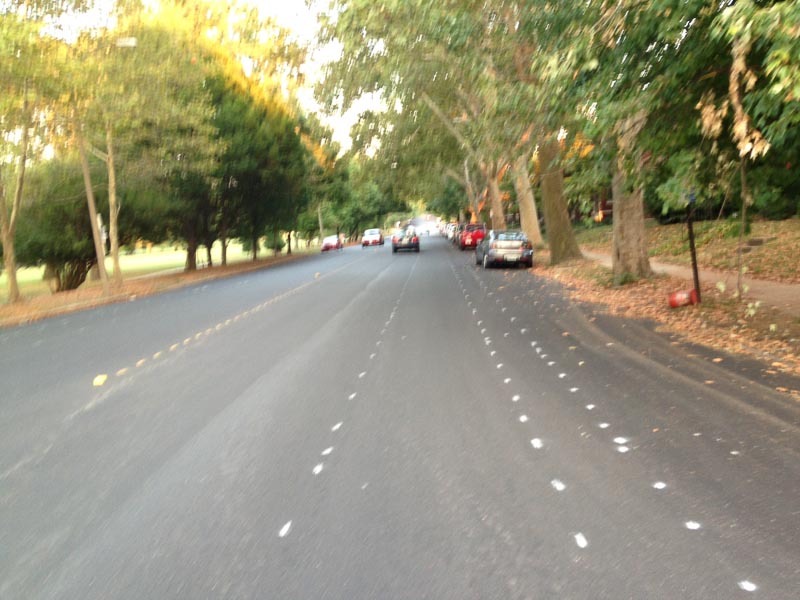 1 Pings/Trackbacks for "New Bike Lanes on Arsenal"